First thing’s first- we wanted to update our readers once again on the Zillow calls we made on Tuesday morning. We designated the Z Weekly $48-49 Calls as our targets and after a good first day, the stock continued its upward climb during yesterday’s session. It isn’t often these days that we target a subpenny OTC stock. Our long-time followers know that those were our primary focus when we started out exactly 7 years ago this past Tuesday. We did very well in that capacity for many years, despite having recently shifted focus more to fast-paced options trading. Of any of the sectors we ever covered in the OTC space, cannabis has certainly been the most exciting, and continues to be one of our primary interests on the stock side of things to this day. That’s why we just want to put HEME on our readers radars. Despite being listed as defunct on OTC Markets, the company recently revealed its intentions to get things back on track and enter the marijuana space. According to its updated website, HEME is presently acquiring, leasing and licensing growers for the cultivation, production and distribution of cannabis and cannabis-related products in southern California. The project site has state Highway access, water and local transportation are convenient and accessible, and the City government has designated the project site – legal planting zoning. We are going to keep tabs on the company’s progress toward not only developing in this new direction, but also coming current on its reporting. Good morning traders! We’re back to kick off another trading week, and we’re going to start off by taking a look at an early mover in HZNP. The stock is gapping up moderately on the tail of a mixed-result earnings release, as a well as the announcement of a 5M share repurchase program. We’re interested in signaling a pair of options contracts in the HZNP chain for observation, should the bullish sentiment we’re seeing here in the premarket boil over into the session. Our targets are going to start out as the HZNP Weekly $14 and 15 Calls. Key resistance is currently sitting at the 50DMA of 16.15. In the event that HZNP were to test and breach that boundary, we’d look to roll up our strike price to the $16′s. YELP was included in our watchlist on Friday, and the stock produced a bullish performance on the day. We observed a 13% rise on the day from a low of 23.66 to a high of 26.75. That’s a respectable single-session move out of a stock in this price range. Moving forward, we’ll be watching closely for YELP to maintain support above its current 200DMA of 23.55. That will act as our deciding point on the chart. Should the stock hold above that level on any pullbacks, we’ll look for possible swing-trade opportunities in YELP Weekly $24-27 Calls. Failure to hold that price point would signal us to flip to the bullish side and the $27-24 Puts. We also want to put SQ on a bottom-watch this morning after a post-market earnings call on Thursday precipitated quite a bit of fallout during Friday’s session. Despite a boosted outlook for the remainder of 2016 and big-time growth compared to the same quarter last year, SQ was absolutely hammered. That makes it fair game for a potential rebound in coming sessions, so we’ll have it on our radar for that possibility. If it appears that a recovery is imminent, we’ll look to use in-the-money calls to leverage some nice gains out of this play. There was no need to be patient with NHMD after we tagged it for observation just prior to the opening bell in yesterday’s premarket report. We noted that the stock had seen some momentum buildup; we were looking for a carryover and found it. The sizable intraday swing came early in the session as NHMD ran from a low of .004-.0074, an 85% pop. It enacted a bit of a dip and rip into a close at .006. We’ll leave a space on our radar screens reserved to monitor NHMD moving forward, as volatile subpenny plays like this can often be good for daily flip opportunities. We’ve got an interesting chart setup in TAX, which as you can plainly see without the aid of annotation on the snapshot below, is currently looking egregiously oversold. 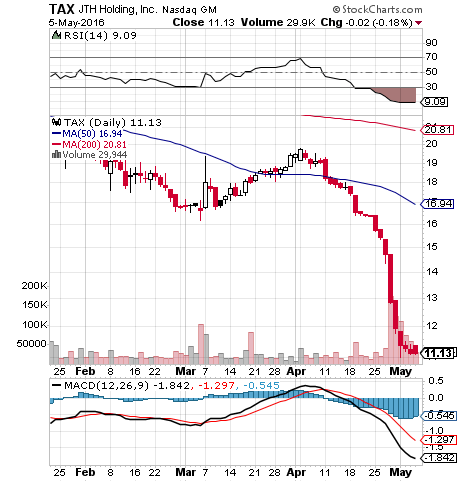 Even as Liberty Tax was recently voted “Best of the Best” by Entrepreneur magazine(>>View PR) the stock has been taking a tremendous beating. Over the past few sessions the stock seems to have been trying to find support in the low $11-range, and that is where we come in. We like to track stocks after they’ve been pounded into the pavement for possible rebound plays, as our regular readers knew very well. In the case of TAX, a return to its 50DMA at which it was trading less than a month ago, would mean gains exceeding 50% over yesterday’s closing price. We’ve got a new item of interest in the penny arena to start things off this morning. Following a major run back in April, SWET has consolidated, and has been generally trading sideways ever since. We like the look of the chart, and feel that conditions are coming to a point where things could get interesting. 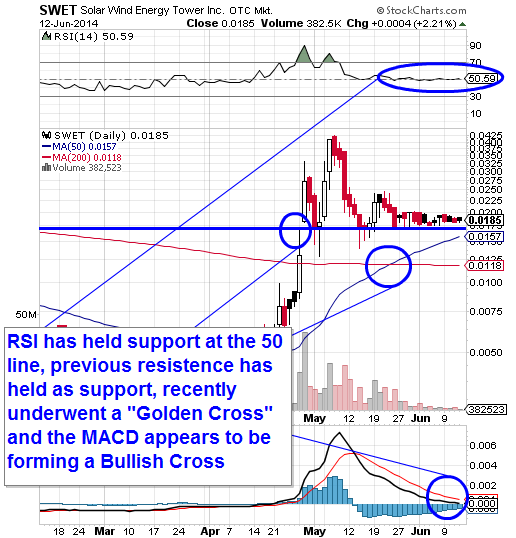 As you can see on the chart below, the RSI has held in there above the 50-line, there’s been a recent Golden Cross of the 50DMA over the 200DMA, and the MACD appears ready to start turning to the bullish side. It may not be too long before we see a pop out of this thing, so we’ll keep an eye peeled for that. With the vast array of stocks that we’re tracking all the time, it isn’t too much of a surprise when one of them perks up its head and regenerates our interest. Such was the case with GBGM yesterday; the last time we made mention of this stock in our daily reports was back on May 1st. At the time, we were monitoring the play for a bottom, which took the better part of the next month to reach. GBGM touched down and found support at .0008 recently, and yesterday the sleeping giant was finally awakened as the company announced that it had retired 50 million shares of common stock, thereby reducing the number of outstanding shares 6%. What resulted was a significant upswing that took the stock as high as .0021 and generated gains of up to 162% for anyone that caught the bottom. OPEN is gapping up tremendously this morning on news that the company is to be acquired by The Priceline Group. In situations like these, we like to monitor these high-flyers for subsequent dip-and-rip scenarios. Specifically regarding the options chain, when a strong move like this is properly utilized, it can spell big gains for those playing the Call side. When something of this magnitude occurs, it can also create a sector-wide ripple effect, so we may also want to track stocks like LIVE, YELP, GRUB, and of course, PCLN.